…and I’m still rolling along. Those of a certain age will remember the old cowboy song about the laws of diminishing returns wheel wise, encountered while trying to escape the attentions of marauding Cherokee Indians. It’s a song that could have been written for a man called Tom Anable. Tom is a man who is driven by a dream. So what’s unusual about that you might say? Well Tom’s dream was shall we say a bit different…but we’ll let him tell the story. Now the history of monowheeels stretches back further than you might think. Leonardo Da Vinci sketched what might have been a forerunner and then in the 17th century a wooden hand-powered model made an entry. Thereafter there is talk of men achieving 30mph on the pedal powered machines in the 1800s, to 90mph petrol powered machines in the 1930s then some rather more ambitious predictions of anything up to 300mph plus! But back to the 21st century where Tom’s story starts gathering momentum. “I built my first monowheel in 2007 and have been chasing the Monowheel Landspeed record ever since. Building, testing, designing, riding… A constant circle! I have built seven in total, not including dead projects, mules and test rigs. These have included electric powered monowheels, pedal powered monocycles, grass track based, tarmac based, stunt and parade machines. The current new big Landspeed Monowheel we are using took around a year to build as it’s a constant development from testing. It currently has a custom aluminium wheel with solid rubber tyre. Sat inside the wheel are three PV developments nylon rollers that the steel chassis runs on. The monowheel is powered by a ktm 400cc 4 stroke single cylinder watercooled motocross engine (sparked by NGK) with airshifter on a 6 speed gear box. From the engine a chain drives a special 3 piece hub with a disc brake attached. Drive is transmitted via rubber friction to the main wheel. The bike has no suspension only rubber mounts on the bars and a sprung seat”. Now the first official Guinness World Record for the fastest Monowheel Motorcycle is that of American Kerry Mclean at 57mph in 2001. 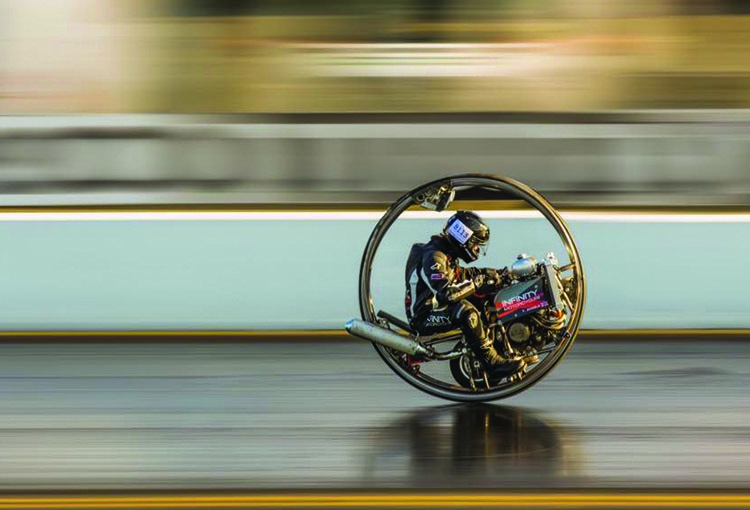 In 2014 Tom broke this record at The World’s Fastest Wheelie Competition with 62.8mph, only to find out the speed must be an average of two runs within one hour measured over a flying quarter mile. 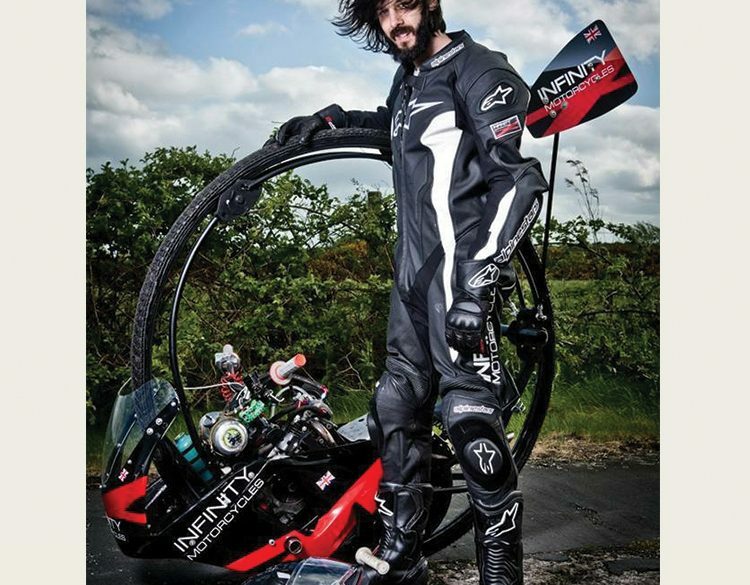 Since then the official Guinness record has been raised by Kevin Scott of England on the Warhorse Monowheel to 61.18mph in 2015. But now sponsored by Infinity Motorcycles and NGK Spark Plugs, riding his new KTM powered steed Tom hopes to smash Kevin Scott’s record and put it out of reach. The ultimate goal is 200mph and beyond, as motorcycles search for 400mph, 3 wheelers aim for over 600mph and cars are going for 1000mph. 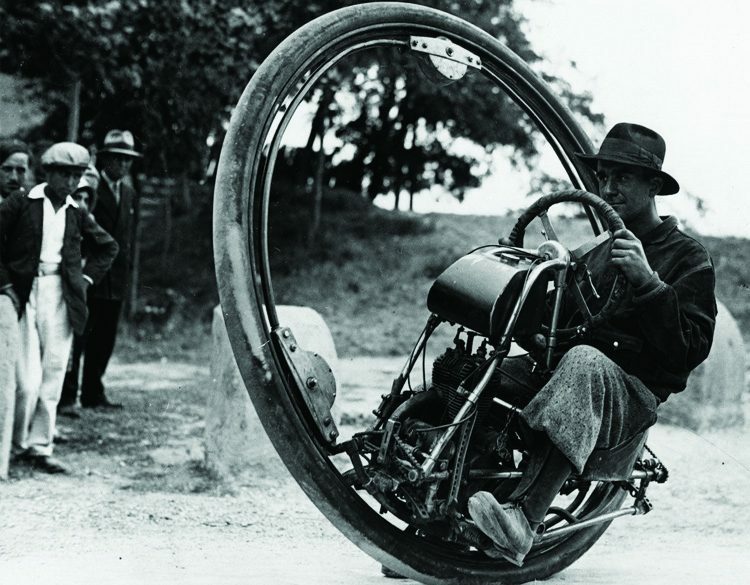 Surely the monowheel can’t stay stuck at 60mph forever! Well not if Tom has his way. He’ll be making several tilts at the world record this year on his Atomic Infinity Monowheel. First off will be at the scene of other previous World Land Speed record attempts at Pendine Sands Wales on 13th and 14th of May. We’ll be with Tom all the way and you can follow his progress on NGK’s facebook page.